The amount of solar energy that hits one square mile of Earth in one year is equivalent to the energy produced from four million barrels of oil. Of course, converting 100 percent of that solar energy is a difficult proposition given the fact that today’s rooftop photovoltaic technology is only capable of converting 15 percent of the Sun’s energy into electricity. However, many companies have committed millions of dollars toward capturing and utilizing as much of that solar energy as possible in order to offset their reliance on fossil fuel energy. One such company is MGM Grand International, and its showpiece can be seen from the air as you pass over the Mandalay Bay. In August, the Mandalay Bay Convention Center will complete an expansion of the convention facility making it the fifth largest in the United States with 2.1 million square feet of space under a single roof. The roof of that facility is already home to the second largest rooftop photovoltaic array in the world, and the completed expansion will increase the total number of panels to 21,324 and the capability to generate 6.5-megawatts of AC power, enough energy to power 1,300 homes. 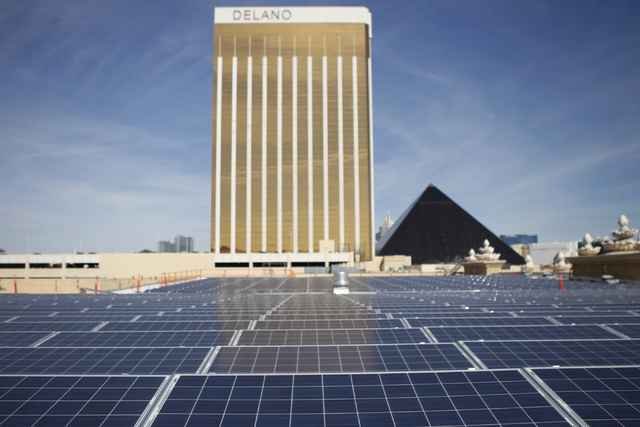 The electricity generated from this system will be used to offset 26 percent of the Mandalay Bay’s power demand. This, in turn, will also lower demand on the southern Nevada electricity grid at the hottest time of the day. The project diminishes the need to import energy from outside the local energy system and reduces energy costs for the entire Las Vegas system. The project is a partnership between MGM International and NRG Energy, Inc., under an agreement where the Mandalay Bay property will purchase the power from NRG at a very competitive rate over the lifetime of the contract. This allows the hotel to predict the exact cost for 26 percent of its power use regardless of NV Energy’s rates. In addition to generating power, this project also helps to clean the air by displacing approximately 6,300 metric tons of carbon dioxide (CO2), emissions that would be generated from fossil fuel power plants. That is about the equivalent of taking the emissions of 1,300 automobiles off the road. While there are few places in the U.S. with as much rooftop space as Mandalay Bay, rooftop photovoltaic systems are being embraced by Corporate America. Wal-Mart has been the quickest to go solar, with 105.1 MW of power currently installed on its stores. The company is working in California, Arizona, and a super store in Gardnerville, Nevada, and plans to be using 100 percent renewable energy by 2020. Kohl’s, Costco, and Ikea stores are also going solar on a nationwide basis, and collectively the three are generating 137.4 MW of power. At the end of 2014, according to its Letter to Shareholders, SolarCity had 190,000 U.S. customers with one gigawatt of combined generated power. With Google’s backing, the company expects to install another 25,000 new solar households, generating another 500 MW of power. In Nevada, SolarCity employs more than 1,000 customer service and installation personnel and installs between 12 and 20 rooftop systems per day.